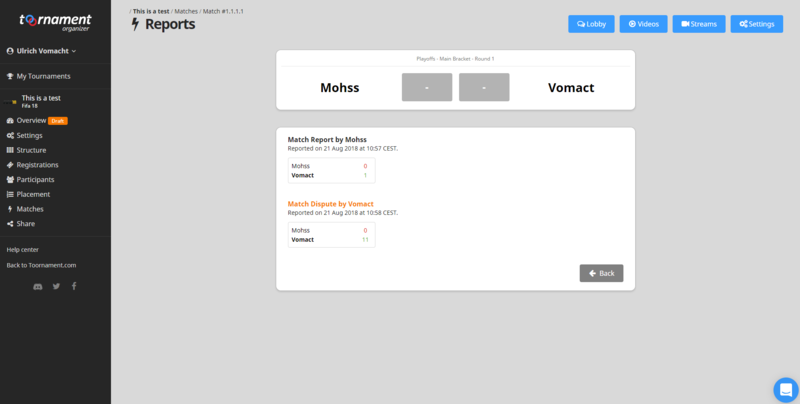 You can access Your Matches either from the top Navigation Menu, or the item directly on the tournament public pages. Then just click on one to report its results. The result (win - draw - loss) is mandatory, scores are optional. You can also upload a screen capture (optional) as a proof of the match result. It happens from time to time that a participant made an error entering the result, score, or match detail. You can enter your own report and submit a Dispute. The match will then be unvalidated until a decision is taken by an admin. If a Dispute over one match occurs, the tournament admin can settle it. They can review both reports and then, either close the dispute or enter their own report, which will act as the definitive one. Participants can’t contest the admin decision over a dispute, but it can still be edited later on.